VooFoo Studios brings back the top-down racer. But is it a good one? 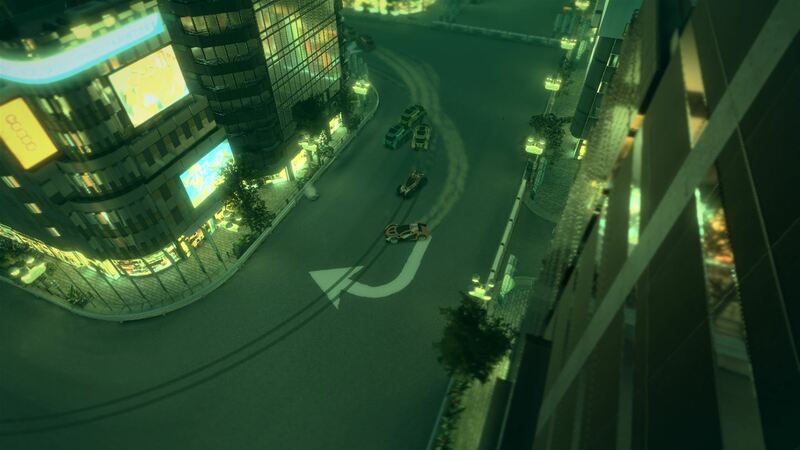 Top-down racing games have long been in the video gaming lexicon. The genre dates back to Atari's 1974 coin-op Gran Track 10, and includes classics like Championship Sprint, Ivan "Ironman" Stewart's Super Off-Road, and the Micro Machines series – all great games that are really fun to play. Over the past decade, though, top-down racers seem to have gone off the boil. There have been plenty of overhead-viewed racing games released on mobile, but they have become a relative rarity on mainstream consoles. As a fan of the genre, I feel that's a bit of a shame, so the recent arrival of VooFoo Studios' Mantis Burn Racing has been a welcome surprise for me. Its action is viewed from a slightly isometric perspective – but to all intents and purposes it drives and plays like a top-down racer. Taking center stage is its comprehensive career mode. Playing out over seven seasons, and incorporating rookie, pro, and veteran divisions, the player progresses through a series of tiered races, unlocking new contests as they succeed. There are a variety of different types of races to challenge you, including straight-up competitions against up to seven AI opponents, solo-race time trials where you have to beat the requisite lap time, knockouts, in which the last-placed racer is eliminated each lap, and accumulators, where you constantly score points based on your race position. Gears are awarded for winning races, and these unlock new contests. Up to three gears can be earned depending on your finishing position, and there are another three available for completing particular challenges during a race, such as drifting a certain distance, knocking down a number of fences, or taking a shortcut. It's a nice idea that adds a little extra depth to the racing – especially once you get to the latter stages of the game, where you need to garner almost all the gears you can get your hands on to be able to progress. Racing also earns you experience and cash. The former levels you up and in the process awards you upgrades for your vehicles. There are actually three classes of racing machine – light, medium, and heavy – and you'll need to buy one of each to be able to compete in all contests. Every vehicle starts out with a trio of upgrade slots, into which you can plug things like improved tires, engine boosters, and better suspension. These have a quite dramatic effect on grip and handling, top speed and acceleration, and momentum conservation when driving over jumps. Once you've filled all three slots, you can then spend cash to level up the vehicle. Doing so upgrades its looks slightly, and adds even more slots so you can continue to improve it – something that's vitally important, because as you progress through the game, the AI opponents become increasingly more challenging. Indeed, it's that level of challenge that makes Mantis Burn Racing a lot of fun to play. Things start out fairly easy, with the standard cars giving you the chance to get to grips with the game's superb handling, and it doesn't take long before you're spectacularly drifting through turns going pretty much flat out. However, once you start upgrading your vehicle, you have to drive with a lot more finesse, braking into corners, and carefully managing your grip so that you emerge under full acceleration. Doing so successfully will keep you ahead of your opponents, but if you start making mistakes, they'll quickly close in on you and overtake. This helps keep the pressure up while racing, making the action tense and exciting. 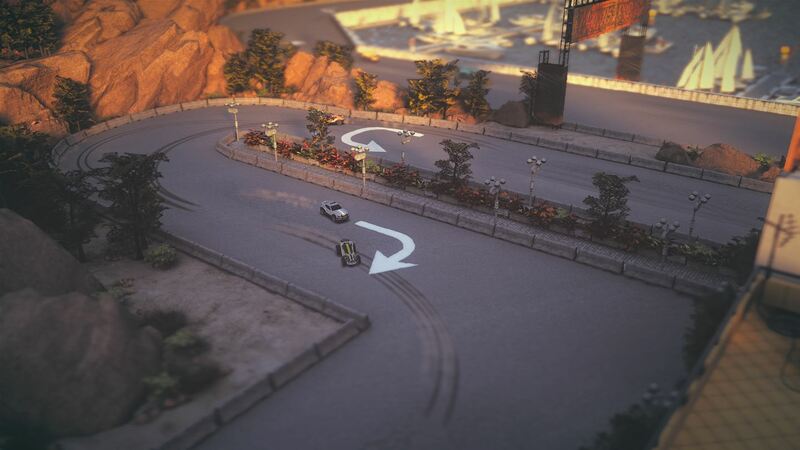 Another factor in making Mantis Burn Racing enjoyable to drive is its track design. 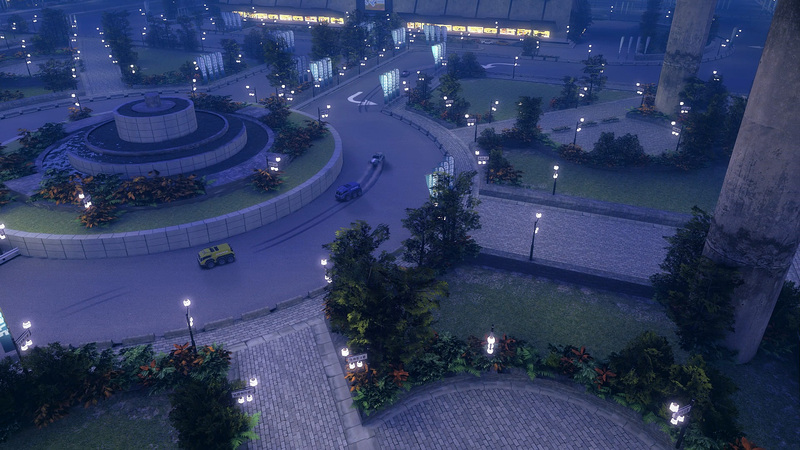 The game is set in two locations – Sand Town and New Shangri-la – and each offers four dirt and urban courses respectively. Tracks are generally quite tight and twisting, which works well with the larger-than-life handling of the cars. What's particularly impressive is how the different track surfaces affect the vehicles' performance: While racing on tarmac, you have good grip, but drive on the dirt, or through wet mud, and the cars slide around a lot more. 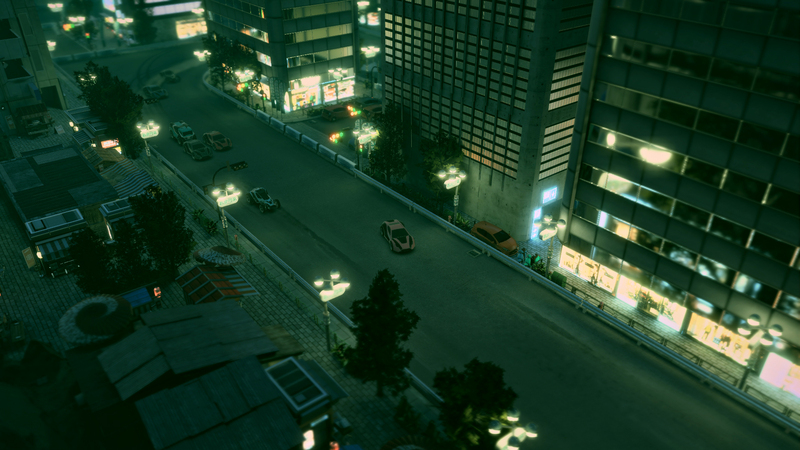 Combine that with the fact that the three classes of cars also handle differently from one another – heavier vehicles are slower to accelerate and turn, while light cars are quicker and more nimble – and you end up with a game whose handling is far more subtle and complex than you might expect from what looks like a simple arcade racer. However, while the tracks are all fun to drive around, there just aren't quite enough of them. Even taking into consideration that courses are raced both ways, I found myself getting a little overly familiar with them by the time I got to the pro racing divisions. Apparently VooFoo Studios will be producing free and paid-for content updates in the coming months, and hopefully that'll include new tracks, but for now, the selection is a little on the disappointing side. 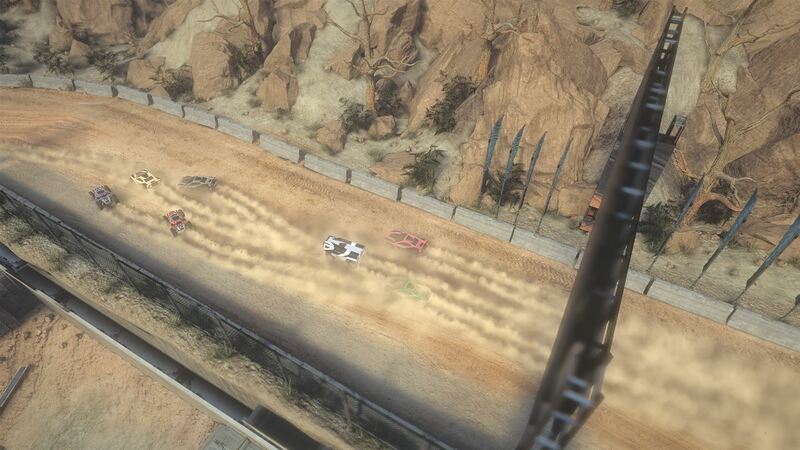 As well as a career mode, Mantis Burn Racing offers a variety of multiplayer options, including split screen local racing for up to four players, and eight-player online competitions. So far, however, I haven't had much luck with online multiplayer races. I think perhaps a combination of the game being fairly new, and me generally playing very late at night has meant that matchmaking has been really, really slow, and I have yet to participate in a full eight-player race. Still, despite its slow multiplayer matchmaking, and rather limited track selection, I've nevertheless enjoyed playing Mantis Burn Racing. Its action is close and competitive, and its handling engine is brilliantly designed to make driving both exciting and exacting. Add in the surprisingly deep career mode, and you have an entertaining racer that creates a great base for VooFoo Studios to build upon. Assuming the developer adds more tracks and cars, the game could go on to become one of the best top-down racers seen in many years. Tagged with PC,	PlayStation 4,	Racing,	racing game,	Reviews,	Xbone.